While developers are paid to create code, sometimes you have to let your inner artist out in order to make the app as good as possible. What do you think about when you hear “design thinking”? This mindset was the focus of Ten-X’s most recent design meet-up in late August. There, Justin highlighted the best research, visual, prototyping, and usability tools that bring teams together and offer the best solutions to business problems. This list has been compiled and summarized below. You can also view the presentation here. Need help finding the right participants for your UX research? Ethnio helps recruit participants by providing a platform that incentivizes responses. For instance, New Relic was offering users $50 if they participated in their research. Ethnio also allows you to do preemptive surveys as well. You can ask users what they expect to see on your application, before even seeing the application itself. Datanyze evaluates the technical landscape by crawling million of websites to find out the specific technology providers each site is using. This tool is great for lead generation, learning where your users go after leaving your site, and conducting deep research into other companies you want to do business with in the future. Smaply is a central research hub where you can create personas, journey maps, and stakeholder maps in one place. It is designed to be collaborative, so you and your team can work on these maps together. This tool primarily focuses on designing visual systems to analyze your team’s next steps. 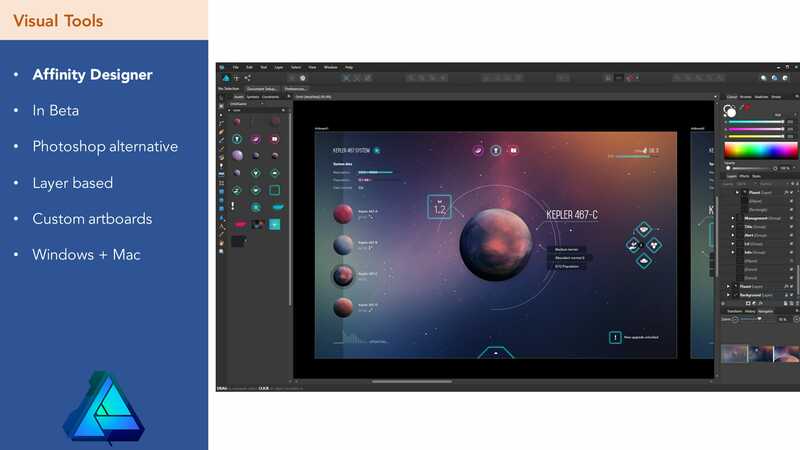 Sketch may dominate the Mac user space, but Affinity Designer is quickly becoming a strong visual tool for Mac and Windows users. It’s a good cross between Sketch and Photoshop (more so on the Photoshop side). It’s a great low-cost alternative as well. You can create high-fidelity mockups and graphics for just $50, no recurring costs. Affinity Designer’s strong PC designer community also makes it a worthy purchase. Figma is a web application and desktop visual tool. It focuses on rapid prototyping, multiple artboards, simple layers, vectorized shapes, and online collaboration. It is kind of like Sketch, but built for teams. With Sketch, you must install plugins to get feedback/collaboration features. With Figma, it's already built-in. This allows multiple people to work on designs at the same time. This tool could be the way to go if you're looking for a more collaborative approach to design work. Snappa is a great visual tool for non-technical designers. With Snappa, you can rapidly create graphics for social media, advertisements, and blogs without the assistance of a graphic designer. They have many pre-made templates, high-resolution photos, and other graphics already installed. All you have to do is drag and drop the pieces together. It's important to have visual tools in your organization that are also catered to non-designers. If they can't articulate what they want, then a designer is mostly going off an assumption of what they want. Snappa is a great way to meet in the middle and find what both parties want. Proto.io allows you to create early stage designs to fully animated prototypes. It’s simple, you can easily drag and drop popular UI buttons on your prototypes and add transitional animations if you’re designing multiple pages. This simple to use interface gives it an advantage to other prototyping tools. For instance, InVision requires you to create five different screens to illustrate a simple drop-down animation. Proto.io requires you to do the same, but its clean interface makes this process a lot less complicated. UXPin allows you to create and collaborate on designs like other prototyping tools. It's contextual feedback system really makes it stand out though. Stakeholders and decision-makers can comment on and approve design from within the tool. These comments can easily be integrated with Slack and email so everyone on the team can see the approval as well. All and all, UXPin is great at bringing designers and non-designers into the prototyping process. Protopie is a mobile first prototyping tool that can create advanced interactions and animations easily. It doesn’t rely on code to create these interactions either, which makes it another great tool for non-technical designers. A designer could use this tool to help non-designers figure out which interactions they are looking to implement with their own applications. Fullstory is a DOM streaming platform that allows you to watch how users interact with your application. It records all their interactions without them knowing, so it's very natural way to conduct a usability test. You can filter certain interactions as well. Say you want to see how users are interacting with a new feature you just implemented. Fullstory allows you to see the various interactions with that one feature without having to watch the rest of the clip. It’s a very powerful tool that can you help identify pain points in your application early on. Usabilla focuses on post-hoc usability. Instead of asking users to rate a feature on a 1-10 scale, they can react with emojis. Often, we rely on net-promoter scores to gauge a consumer’s experience, but Usabilla is more concerned with how the user feels in that moment. This allows for emotion tracking, which creates a different genre of usability feedback that stands out from the rest.